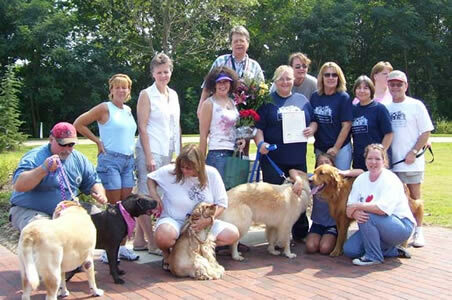 1st Annual Paulding County Humane Society "Doggie Daze"
Some started at the Chamber of Commerce and walked 3/4 mile West to Tara's Park. Others came from farther. But no metter where they came from, there were plenty of people with their doggies. Sweating in 100degrees, pool wading, water drinking, and eating free hotdogs kept everyone busy. Proceeds benefit the Paulding County Humane Society. A number of sponsors and vendors setup tents with products, services, and give-aways. Dr. Frank Penney, Animal Chiropractor Handy Hubby Home Improvement Services HomePlace Communities -- THANKS FOR THE HOTDOGS!!!! Thank You to Terry for coordinating and organizing a great event. 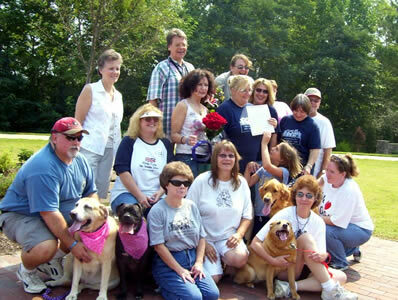 Mostly, thank you for honoring Tara by using the Park.